Pointar lens and Vario shutter. 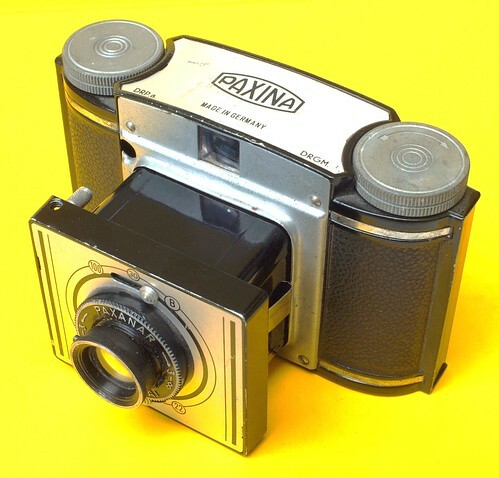 Paxina is a line of medium-format viewfinder cameras for 6×6 cm exposures on 120 film, made by the Braun company in Nuremberg, Germany in the middle part of the 20th century. 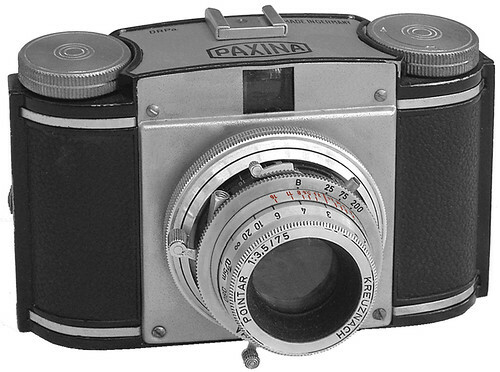 The first Paxina model (numbered I only retrospectively, because of the existence of the model II) was made in 1950-54. It is very similar to Braun's earlier Pax (the only significant difference being the basic focusing control). The lens is a Paxanar 75 mm f/7.7 achromat; it has three aperture settings (f/7.7, f/11 and f/22). It has very coarse zone focusing, with one marking for 1-3 metres and another for 3 m - infinity. The everset shutter has speeds 1/100 and 1/30 second, plus 'B'. The shutter release is hidden behind the lens panel, which pulls out from the camera on a square lens tube; springs on each side pop out to keep the tube out, and straight. The viewfinder is a reverse Galilean one, built into the body. The Paxina II was made from 1951-57, and offered alongside the original model. It still has a collapsing lens tube, but this is round. Several different lens and shutter combinations were offered during the period of production (McKeown lists the camera as four sub-models, II, IIa, IIb and IIc, according to the lens). Some of the options represents a distinct step up in specification from the previous model. Lenses (all 75 mm) include an f/3.5 Kataplast or f/3.5 Kata by Staeble, an f/3.5 Pointar (by Roeschlein, but labelled only Kreuznach), an f/3.5 or f/6.3 Steinar by Steiner, an f/3.5, f/6.3 or f/8 Praxar and a Pranar (of unspecified aperture but similar in size to the f/8 Praxar). Shutters with the better lenses include the Pronto, Vario or even Prontor SVS; the better of these have a cable release socket and even a self-timer; other models have a simple shutter with 'I' and 'B' exposure (but synchronised, with a PC socket). The camera has a cold shoe on the top plate, and a slightly deeper film winding knob than the previous model; otherwise it is similar. The Paxina 29 was made from 1953. It has the fastest lenses of the series, and f/2.9 Praxar or Steinar, in a Pronto or Prontor SVS shutter. 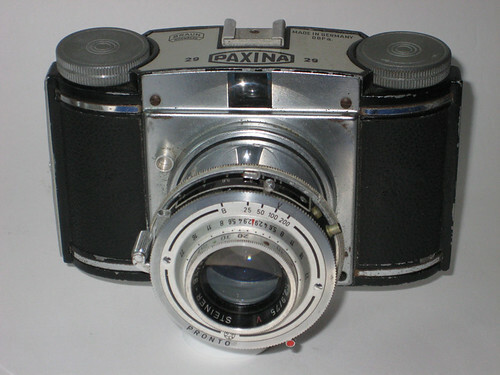 The Paxina 35 is clearly of the same age as the 29, and differs mostly in having an f/3.5 lens. The line was continued with a model for 4×4 cm pictures on 127 film, the Paxina Electromatic. ↑ 1.0 1.1 1.2 McKeown, James M. and Joan C. McKeown's Price Guide to Antique and Classic Cameras, 12th Edition, 2005-2006. USA, Centennial Photo Service, 2004. ISBN 0-931838-40-1 (hardcover). ISBN 0-931838-41-X (softcover). p155-6. Paxina 35 with a Praxanar lens, with pictures, at the Nelsonfoto fora. This page was last edited on 20 February 2017, at 06:18.